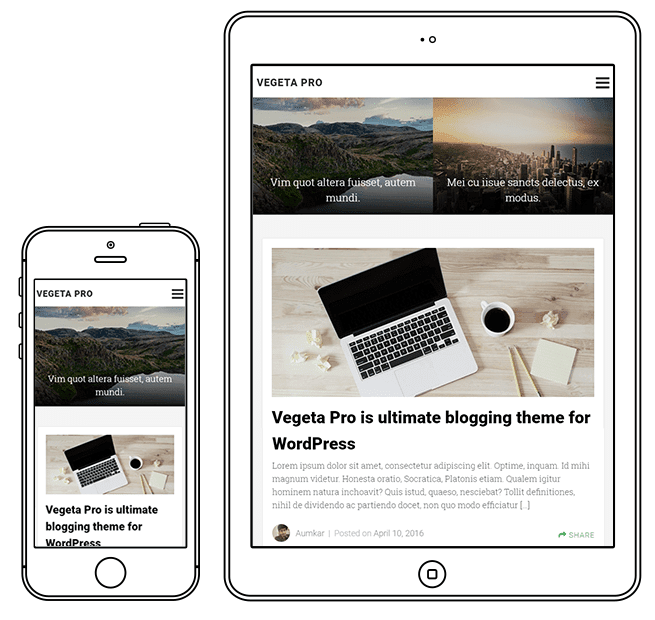 Vegeta is fully responsive, every posts automatically changes its width according to screen size . It loads very quickly on mobile and provide better user experience. The theme customizer allows you to tweak the theme’s settings and see a preview in real time. VegetaPro comes with lots of Google fonts pre installed, change fonts with just one click. It helps crawlers and bots to understand your HTML site structure and content properly. It loads in the blink of an eye to reduce bounce rate and to provide great experience. VegetaPro works great with all SEO Plugin for WordPress out there but we recommend Yoast. You can add email signup box in sidebar, It supports Aweber, Feedburner and Mailchimp. VegetaPro comes with social sharing and follow buttons which are easily customizable. We’ve made monetization easy for you! VegetaPro is designed with ads unit in mind. Related post widget will keep your readers engaged, It will show post with same tags and categories. We’ve added elegantly design author bio box which shows above comment form. This theme is translation ready which means you can translate it into any language.